Monica Jahan Bose presents an interactive performance to raise awareness about climate change and the global implications of our individual use of energy. She has created a number of saris in collaboration with coastal women from her native Bangladesh (who stand to lose their homeland as a result of climate change) as well as in collaboration with DC residents. Join the sari procession and make a climate pledge on a sari, which will all be sent back to Bangladesh to be worn as a garment by coastal women. 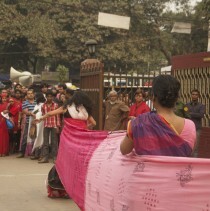 The saris have been featured in performances around the US, including Art Basel Miami Beach, the Dumbo Arts Festival, Simpson College in Iowa, and the Brooklyn Museum, and recently at the Bangladesh National Museum. Follow the project on storytellingwithsaris.com.